An year-on-year price comparison between December 2007 and December 2006 made by the State Commission on Commodity Exchanges and Wholesale Markets showed that food prices were higher this year. The biggest price jump was registered for cooking oil (79 per cent) and flour (56 per cent). Other considerable price rises, by 30 to 40 per cent, were reported for dairy products, eggs and rice. Lentils and beans went up 20 to 25 per cent. Sugar and chicken prices rose 10 to 13 per cent on year in December. At the other end of the scale, frankfurter sausages rose by a mere 2 per cent. Comparative analysis between the average prices of fruits and vegetables in December 2007 and a year earlier showed that, although typically expensive in winter, hothouse tomatoes and cucumbers actually went down from last year. Tomatoes sold at 1.80 leva/kg this winter, down from 1.90 leva/kg a year earlier. As to Bulgarian-grown fruits and vegetables, cabbage went up by a record 50 per cent, followed by potatoes, up by 30 per cent from last December. Apple prices were just 3 per cent higher this December. 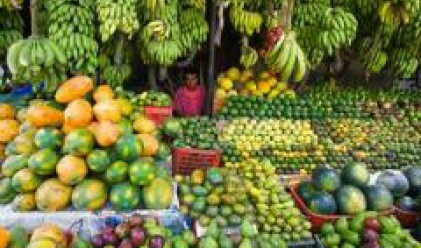 Comparing tropical fruit prices, the Commission registered the largest increase for lemons at 75 per cent and bananas at 51 per cent. Oranges went up 14 per cent and tangerines appreciated 10 per cent. The wholesale prices of some staple foods trended further up from November as is typical of wholesale trade in the last month of the year. For example, flour and cooking oil prices went up 2 per cent from November, which, however, is less than in earlier month-on-month comparisons. Rice and beans prices climbed 3 to 4 per cent, and lentils and eggs went up 6 per cent. Yellow kashkaval cheese rose a mere 0.4 per cent, and white brined cheese went down about 2 per cent from November. Chicken meat traded 1 per cent below its November price. Sugar remained unchanged at 1.54 leva/kg. Most fruit and vegetable prices rose from November. Lemons trended further up, rising 8 per cent in December. Due to larger supply, oranges and tangerines sold respectively 19 per cent and 12 per cent below their November prices.